Let us start by stating an important disclaimer: if you love a look, we believe that confidence is all it takes to pull it off! That being said, it’s no secret that some clothes are more complementing than others. You know what we mean – there are outfits you love because of how THEY look, and other outfits you love because of how they make YOU look. First, determine if you have a cool or warm skin tone. Check the color of the veins in your arm. Blue/purple veins typically indicate a cool skin tone, while blue/green indicate warm. Note whether gold or silver jewelry fits you best. Gold typically indicates warm-toned, and silver indicates cool. Do you look best in white or ivory? 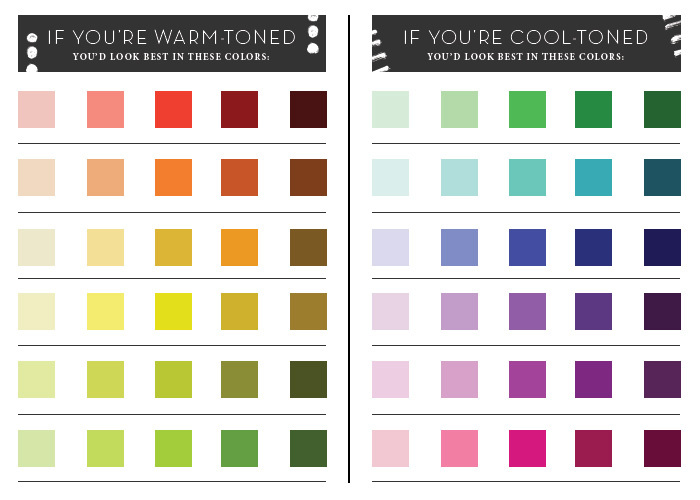 White indicates cool-toned, while ivory indicates warm. Still unsure? Check out an online quiz (trust us, there’s a lot), like this one from Seventeen magazine. What does this mean for your wardrobe? For cool-toned individuals, it means you have pink/red undertones in your skin. Therefore, you will look great in jewel-tones like blue, green, pink, purple, turquoise, and blue-based (rather than orange-based) reds. On the other hand, warm-toned individuals have golden or peach undertones. Your best colors include earth tones like browns, olive greens, and yellow-greens, as well as orange-based reds and ivories. Second, further narrow your color palette based on your skin hue. If you have a light complexion, go for dark and pastel shades of the colors that you determined in step one. If you have a medium complexion, look to the middle of the color shade spectrum. Also, a medium complexion should not be afraid to go neon! If you have a darker complexion, your color sweet spot will be bright (but not quite neon) shades – think cobalt blue, fire-engine red, or kelly green. This complexion also lends itself to darker shades of pastels. Last, when you want to find that one perfect color, consider your hair and eye color. When your goal is to make your hair and eyes pop, look to the color scheme you established with the previous steps. Select a color from the group that complements your eyes and contrasts with your hair. For example, if you have blue eyes and dark hair, choose a lighter blue color to accentuate your eyes and serve as a light backdrop for your hair. If you have brown eyes and brown hair, a color like gold or tan can bring out the flecks in your eyes while still contrasting enough with your hair to let it shine. Tell us by commenting below, what colors do you love to wear, and what other tricks do you use to find the shades that best complement you? Blue green veins suggest that you are warm-toned, and there are a lot of great pinks that complement warm skin tones! Look for a pink that has a hint of orange, like a coral. If you're having trouble finding warm-toned colors, check out our collection here on Buckle.com: http://www.buckle.com/womens/color:bronze+brown+copper+cream+gold+green+orange+red+white . i like to wear pink. older people tell me i should not wear dark colors. i have blue green veins. most times i can't find warm toned colors.